Are you sitting down? Ready to be stunned and shocked with this latest bit of iPad news? OK, good – because there are tons of iPad-related sales already going on and set to run through the Thanksgiving holiday weekend. I’ll be posting a little more lightly tomorrow and Friday, so I thought I’d get a head start on sharing some of the holiday sales news before we hit Thanksgiving day here in the US. This is not any sort of comprehensive list of iPad related sales – I’d have to do nothing else all day to even attempt to do that sort of thing. These are just some of the notable iPad app and accessory sales that have already caught my eye. I’ll try to add more in coming days if I have time. The Dark Meadow universal app – $5.99 down to $0.99 – this ‘dark fairytale’ game has got fantastic reviews and looks really different and interesting. Photo Toaster: $1.99 to $0.99 – this is probably my most-used photo editing app on the iPad. Super easy to use and can really improve (even my terrible) photos quickly. iPad 2 Display Dock: 65% Off – $69.95 to $24.95 – while supplies last. This is the display case that’s meant to ‘give your iPad the professional look of the Apple store’. 1Password Pro: $14.99 down to $6.99. Absolutely superb password manager app. $6.99 is a great price, especially considering this is a universal app that will run on your iPad and iPhone. Real Racing 2 HD: $6.99 to $4.99. The first iPad game to offer full support for AirPlay Mirroring, and the devs have been constantly improving this feature ever since iOS 5 was released. 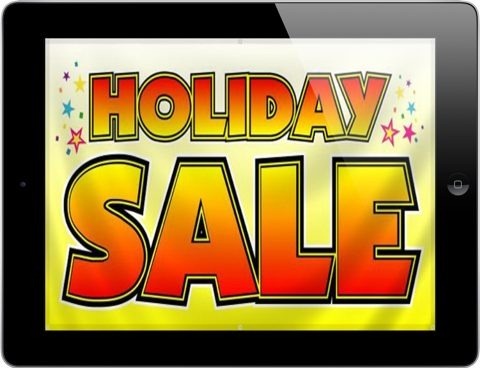 As is now a tradition, EA, Sega, and Gameloft have also got lots of their leading iPad game titles heavily discounted for the holiday weekend. AviiQ: iPad 2 smart cases and case stands at up to 50% off. Gelaskins: 20% off all their lovely skins for iPad 2. These are my favorite companions for the iPad 2 smart cover. Printer Pro: $6.99 down to $4.99 – for one of the best 3rd party wireless printing apps for iPad. Readdle Docs for iPad: $4.99 to $2.99 – for an excellent PDF viewer and more app. Star Walk for iPad: $4.99 down to $3.99 – for a great astronomy and star gazing app.